At twenty one Mia Heathcote already possesses an incredible artistic maturity that resonates with audiences on much more than just a physical level. Perhaps it's because dance evidently runs in her blood - both Mia's mother and father have a dance background - Dad Steven Heathcote is Australian Ballet royalty. Whatever the case, the young star has a great respect and affinity for the emotion and the story-telling that's behind the art of ballet. When you pair this with Mia's attention to detail, an engagingly warm demeanour (her smile never seems to falter, even when discussing sobering things like injuries and self-doubt) and an over-abundance of humility, it's clear that there's a wonderfully bright future in store for the Melbourne-born protégée. Currently enjoying her third year with Australia's prestigious Queensland Ballet, under the Artistic Direction of Li Cunxin, Mia visited us at Energetiks HQ to chat about growing up in a ballet home, future aspirations and some of her favourite things - read on to find out! E: How old were you when you began dancing, and what was your first impression of dance? E: Both of your parents were dancers. What was that like growing up? Do you think it affected the way you felt about dance? M: It was definitely an advantage having parents who knew the industry. Growing up being surrounded by dance was such a great thing to be a part of. It was always so creative. I grew up watching the Australian Ballet and I used to hang off the barres in the studio… I just sat there in awe of everyone, wanting to do it myself. E: So did you ever get to see your parents perform? M: I did get to see my dad perform, it was pretty awesome. It was sort of all I knew growing up. I even used to have tantrums if I couldn’t go into ‘Daddy’s work!' So yes, I just loved everything about it. E: How are you enjoying dancing with the Queensland Ballet? M: I love dancing with the Queensland Ballet. It’s been such a valuable experience so far and it’s such a great company. I’ve had some really great opportunities so far that I’m so grateful for and we’re like a little family. Everyone’s so supportive. I’m really enjoying my time there. Above: Mia in Liam Scarlett's A Midsummer Night's Dream, Three Preludes, and Derek Deane's Strictly Gershwin (with Shane Weurthner). Photography: David Kelly. Images courtesy of the Queensland Ballet. E: You were still in The Australian Ballet School when you were accepted into the QB Company, weren't you? M: Yes. I auditioned for the Queensland Ballet towards the end of my second last year at The Australian Ballet School. I was in level 7 and decided to go on and do the audition for experience because I knew that the next year I’d be going on to do lots of auditions (depending on the circumstances!). I went for pure experience and really wasn’t expecting anything from it. I didn’t even think of the outcome, but then I was offered a job that day so I had a big decision to make! I wanted to step outside of my comfort zone a little bit and experience something different. It’s sort of an expected path to go right through the school and (hopefully) get into a company, so I was surprised by the opportunity and thought, ‘Well, I have to take this’ or I’d never have known what opportunity it could have brought. E: What are some of your aspirations for the future? M: To be the best version of myself that I can be as a dancer and a person. And of course I’d love to dance all over the world and share my love and passion with audiences abroad. E: Which artists and people have had the most impact on you as a dancer? M: I think growing up surrounded by this artform I found inspiration through everyone that I watched. I was really lucky to have a Dad that was so inspiring to me and showed me what it meant to be an artist and I really admire his attitude and humility, so he had a huge impact on me growing up. But there is one other person in particular who's my ultimate inspiration: Alessandra Ferri! I think she’s the most incredible artist. I used to watch her in Kenneth McMillian’s Romeo and Juliet – especially the bedroom scene - and it used to move me to tears every single time I watched it. So she’s really had a massive impact on me, showing me what I’d like to be as a dancer and just being constantly inspired by her. Plus she’s still so amazing, even at the age she is! Mia as a Snowflake from the Nutcracker. Photgraphy: David Kelly. Image courtesy of the Queensland Ballet. E: Is there a role in particular that you’d absolutely love to dance? M: Oh too many! (laughs) Can I say a few? I would love to do Juliet, and Manon… I'd love to do Giselle and I would definitely love to do Tatiana in Onegin - that would be a dream! E: What’s your favourite guilty pleasure? M: Probably watching The Bachelor or The Bachelorette, it’s just so cringe-worthy and hilarious! It’s so bad that it’s good! (laughs)... and probably eating Milo out of the tin! E: In what moments are you happiest as a dancer? M: When I’m on stage and I feel completely present and in harmony with the music and my partner. I think it’s those moments, where you feel like you have the audience in the palm of your hand - it’s this really beautiful feeling. 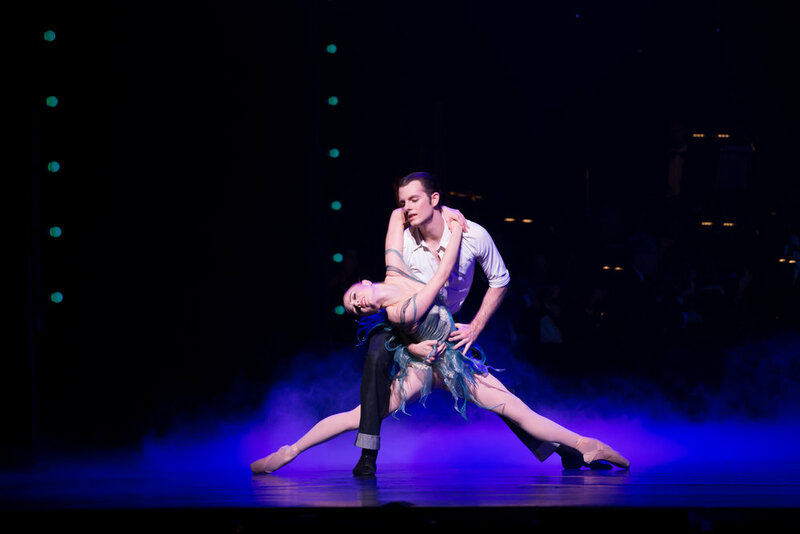 Mia on stage with Alexander Idaszak in Ben Stevenson’s Three Preludes for the Queensland Ballet. Photography: David Kelly. E: What is the best advice you’ve ever been given? M: I've been given so many pieces of valuable advice throughout the years, but I think something that really resonated with me was when Alina Cojocaru came to guest with us for Sleeping Beauty last year. She said, "You can’t be nervous and grateful at the same time, so when you’re feeling those nerves side-stage or wherever you are, breathe, first of all, and then remember how grateful you are to be in the position that you’re in and those nerves will dissipate." E: What’s something you could spend hours doing? M: Being creative in some way; I love to make things, in particular making my own personalised cards. I have an obsession with beautiful paper! And I could probably listen to music whilst making cards for hours. Another thing I could do for hours is talk to my roommate, we just have the best conversations. E: If you weren’t dancing, what other career would you pursue? M: I’ve thought about this a lot and I actually have no idea, but I think it would definitely have to do with being creative in a different sort of way. Whether it’s design or just something that’s artistic. M: Probably ‘classic’, ‘vintage’ – I love vintage! - and a bit of ‘fun’. E: What would be one of the highlights of this year for you? 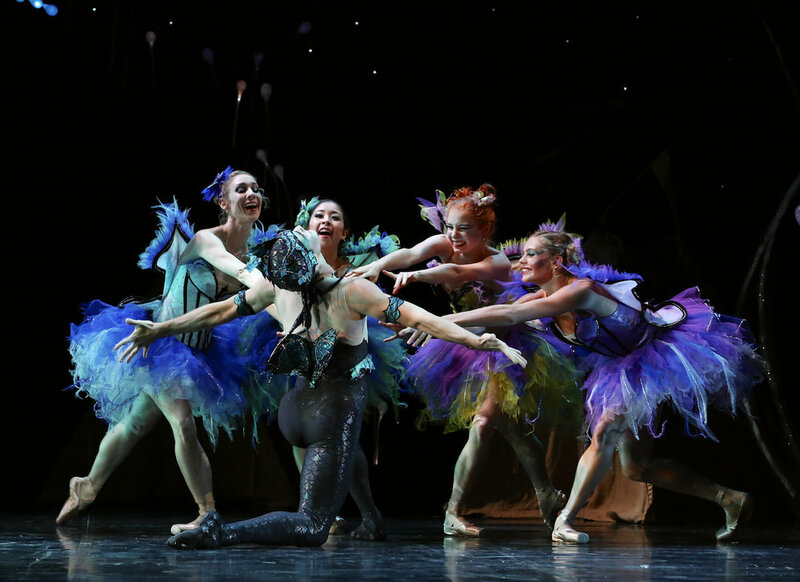 M: Having the opportunity to perform Titania in A Midsummer Night’s Dream – I still can’t believe it actually happened! M: My friends, definitely. And my family as well – my grandparents make me laugh just with how cute they are! E: Have you had to deal with an injuries in your career? What was the recovery process like and how did you stay positive? M: Yes, I’ve had quite a few injuries. In my first year at QB I had a lot of problems with my ankle and I ended up having posterior impingement surgery that year, which was pretty tough. It taught me a lot, but it was quite a challenging first year and a half. Not just the physical side of things but mentally. I found it really hard, I’m not going to lie, so it wasn’t the best start to company life. I wouldn’t however take any of it back because that experience taught me a lot about myself as a person and dancer. I learned so much about my body and how to deal with it and maintain it better. After the surgery, I came back home to Melbourne for a few months for rehab. I had a great team in Melbourne and also back in Brisbane helping me and I had lots of people supporting me through this tough time. I do think however it’s something that no-one gets away with in this career; everyone will have times where they feel like it’s the end or they can’t push on any further or that it’s not worth it. It’s once you do push through, which I did (and still to this day I have to remind myself to stay strong mentally) that it definitely makes you stronger, in a lot of different ways. E: Dancer's schedules are so demanding both mentally and physically. How do you look after yourself and ensure that you don’t burn out? M: I think what’s really important in maintaining your health is that you have to be content in yourself, which is really hard. I still struggle a lot with the way I am because as dancers we’re always trying to be perfect, which is obviously unattainable as we’re all uniquely different. For me, I feel my best when I’m eating well, so really fresh food, fresh fruit and vegetables, basically enough fuel to keep my body going. I also get enough sleep (that’s really important!) and try to have a life outside of work. It can get so crazy and demanding that I think having a good family life and good friendships outside of work and the time to do things other than dance is a really healthy way to stay balanced. E: What’s one theatre or city you’d love to dance in one day? M: I’d love to dance all over the world, but I remember the first time I saw Opera Garnier and I just fell in love with it! I don’t know if that’ll ever happen but at least I get to look at it! (laughs) Actually I think somewhere that would be nice to dance would be outside on a pontoon on the water – somewhere tropical! E: Finally, do you have any last words of advice for aspiring dancers? M: If I could impart any advice on an aspiring young dancer (which I actually still feel like myself!) it would be that while you are growing up and in training to know and value your uniqueness and use that. Play to your strengths because not everyone is going to have incredibly arch-y feet, or hyperextended legs, or flexibility, or a high jump, or can do ten pirouettes. So you just have to find what is unique about you and really use that and value that. Personally, I found it really hard to do. It was always, ‘everybody else is doing better than me’ or ‘they got their leg higher than me.' You look at them and you think, ‘Oh I wish I had that’ but you don’t (she gives a sheepish shrug and smiles). Not everyone does, I didn’t have everything and I still don’t have everything. It's best to remind yourself why you’re here and what makes you love it. And at the end of the day know what you’re there to do, which is to bring beauty and give value to the audience, to evoke those powerful feelings in them. In the end that’s what it is - it’s about telling a story. That’s really important to me and I hope that younger dancers really understand that ballet is about telling that story and sharing that passion, and the sheer beauty of it. Photography: David Kelly. Image courtesy of the Queensland Ballet. Thanks for chatting with us Mia. We look forward to seeing you continue to achieve great things in the dance world and watching your career unfold! For performance details and to see Mia on stage with the Queensland Ballet do take a look at their 2017 season programme. Energetiks interview and photoshoot with Mia Heathcote, 2016. By Elly Ford.